The feeling of blazing down the open road in a motorcycle is thrilling and inspiring, but carries with it greater risk in an auto accident. Due to their small size, motorcycles are more difficult for motorists to see than cars, and their riders can be sent flying much more easily. If you or a loved one is struck by a car while riding a motorcycle, the consequences could be disastrous. Injuries from your motorcycle accident can cost you a lot, both physically and financially. Findlay Personal Injury Lawyers will do its best to help you receive compensation for your damages. 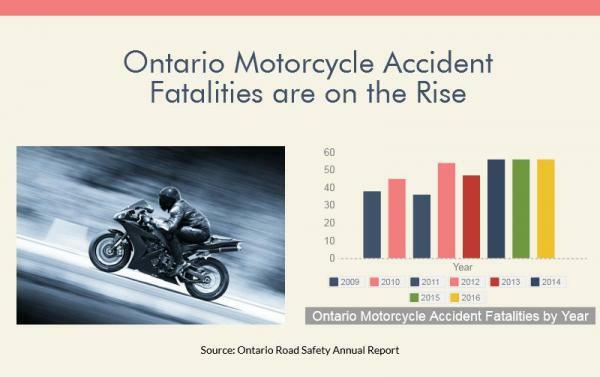 Call our Ontario motorcycle accident lawyers at 905-522-9799 for a free legal review. Wrecking your motorcycle can send you into critical care. Your relatively unprotected body exiting the bike and striking the road at around 100kph is enough force to snap ligaments, break bones, and tear the skin off your body anywhere you’re not wearing top-quality protective gear. And that’s to say nothing of riders who don’t wear helmets. Your injuries will qualify you for accident benefits regardless of fault. Victims of motorcycle crashes also qualify for loss transfer, a law designed to make damages between insurance companies more equitable when the injury is not. Under loss transfer, if a car and motorcycle crash, the car owner’s insurance will pay for a portion of the motorcyclist’s expenses. Loss transfer is governed by vehicle size: any time a trailer truck hits a car, or a car hits a motorcycle, loss transfer is likely to kick in. If your lawyer can prove the other driver was at fault for the accident, you may also sue the driver for additional damages. These can cover straightforward costs like medical, rehab, and wage-replacement expenses, or it can involve more abstract concepts like pain and suffering. While many non-motorcyclists have an impression of motorcycle drivers as reckless and impulsive on the road, the fact is that many motorcycle wrecks are caused by drivers of cars. Since motorcycles are so small, often drivers fail to notice them as they merge or turn, which then leads to a crash. In addition, the small and light nature of motorcycles means that everyday road conditions that cars drive over without a second thought can be deadly for a motorcyclist. Things like potholes or fallen leaves can cause a devastating accident. If you have been in a motorcycle accident caused by someone else’s negligence, call Findlay Personal Injury Lawyers for your complimentary consultation. If your crash is found to have been caused by another driver, hazardous road conditions, or a defective part in your motorcycle, you may be entitled to compensation beyond your basic accident benefits. If you or anyone else involved was severely injured in a motorcycle accident, the first thing to do is call 911. The safety and health of everyone involved comes first. Even if you think you were not injured badly, you should visit a doctor as soon as possible. Motorcycle accidents rarely leave victims unscathed, and you may have delayed onset injuries. Many doctors are trained in what to look for when someone has been in a motorcycle crash, and they may discover injuries that you were not initially aware of. In Ontario, you are required to wear a helmet while riding a motorcycle, no exceptions. This extends to motorcycle passengers as well. Even if it were not legally required, it would still be a good idea to wear a helmet. Motorcycle helmets are the best line of defense against traumatic brain injury in the case of a motorcycle crash, and can be the difference between life and death in many cases. 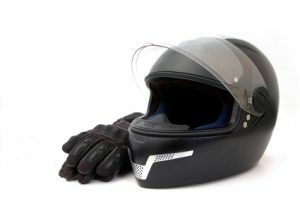 There are many different types of motorcycle helmet to choose from, so you should pick the one that best meets your needs. Regardless of what kind of helmet you get, it should fit well and be comfortable enough that you will wear it every time you ride. A helmet does no good if it’s sitting in your house when you are in an accident. You should also consider investing in good, protective clothing to wear while riding your motorcycle. Jeans and a t-shirt alone don’t provide a lot of protection from road rash. Lane splitting, which is the term for motorcyclists driving between lanes of cars, is generally considered illegal in Ontario. Although it is not expressly prohibited by law, the Ministry of Transportation states that it is too dangerous and advises against the practice. If you are caught lane splitting, you can get a ticket for careless driving or another related infraction. Sometimes, though, lane splitting may be the safest option for a motorcyclist. For instance, if a car is coming up behind you and obviously doesn’t see you or start to slow down, it may be in your best interest to drive up next to the car in front of you rather than wait to be rear-ended. This is a judgment call that you will have to make yourself. 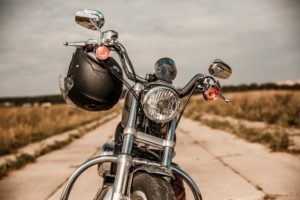 If you are the family member of someone who was tragically killed in a motorcycle accident caused by another driver’s negligence, you may be able to file a wrongful death lawsuit. Losing a loved one takes a financial and emotional toll. While we cannot help with your grieving process, we can help you with financial costs in a compassionate and caring manner. If your loved one contributed significant income to your household, their death can be devastating in more ways than one. On top of the grief of losing a spouse, child, or parent, you now also have to find a way to make ends meet so that you don’t go into debt. We can at least help you with this part so that you can mourn without worrying about where you’ll find the money to pay for your loved one’s funeral. Call us as soon as you can, as there is a limited amount of time in Ontario to file a wrongful death lawsuit. Whether you are a motorcycle rider or the driver of a car, there are steps you can take to help lower your chances of being involved in a motorcycle crash. Driving safely, staying aware of your surroundings, and paying attention to the road and other drivers is of paramount importance in order to avoid causing a motorcycle wreck. Even if you drive as safely as possible, though, there is always a chance that someone else will drive negligently and cause an accident. If this happens, call the motorcycle crash attorneys at Findlay Personal Injury Lawyers as soon as you can for your complimentary consultation. When it comes time to make a decision, if you decide to sue, Findlay Personal Injury Lawyers will be there to take your call. We have the medical and legal knowledge necessary to create a personalized care plan that allows you to recover while we deal with insurance companies and at-fault drivers. You’re in good hands with our motorcycle accident attorneys. To schedule a free initial consultation at our offices, located convenient to Hamilton, Brantford, Burlington, Stoney Creek, St. Catharines, and Niagara Falls, contact Findlay Personal Injury Lawyers by dialing 905-522-9799 today.